I created this card the other night, and I like how it turned out. 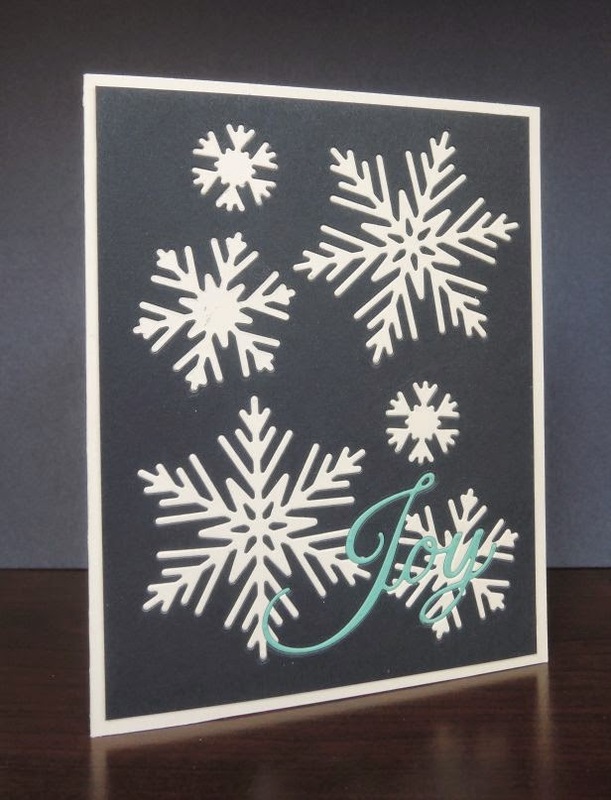 I used these dies from WPlus9 to die cut the snowflakes and the word Joy from this set from Penny Black. The technique is called inlaid die cutting. First, I cut the snowflakes out of Neenah Solar White 80 pound card stock. This I arranged them on the Nightshift blue card stock the way I wanted them to look. I replaced the paper snowflakes with the dies, and cut them out of the blue card stock. I used the negative space of the blue card stock for the card. I ran adhesive all along a piece of thin copy paper cut slightly smaller than the blue card stock, and then adhered it to the back of the card stock. This meant that the snowflake "holes" had adhesive behind them. I placed the white snowflakes into their spots, like a puzzle. Once that was done, I cut the word Joy out of both the aqua paper (either this one or this one, I can't remember) and the blue panel. I used a second piece of copy paper, cut larger than the word joy, applied adhesive (using a tape runner) across it, and adhered it to the back of the blue panel. I popped in the aqua joy, and that completed the panel. To make sure everything was well "stuck," I burnished the card panel with my bone folder. I then adhered the panel to an A2 Neenah solar white 110 pound card base. The sentiment inside says "Thinking of You." I like this card because I like blue ( a whole lot) and I love how it feels once its complete. The technique yields a smooth card - just a little bit of texture where the inlaid die cuts meet the card. I made this card as an anniversary card for two friends. I'm not sure where the idea was born, but I like it. 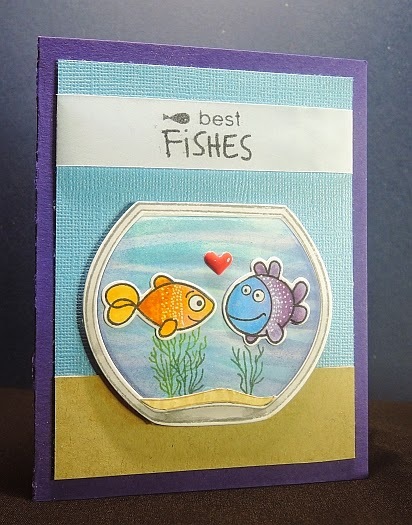 The stamp and die set is from Simon Says Stamp: Keep Swimming. The water in the bowl is stenciled with the SSS Waves stencil. I used several blueish distressed ink pads and mini inkers. After I used one color, I would move the stencil and add the next color. I colored the sand die cut with shades of light brown copic markers and the bowl with two shades of neutral gray. The greenery in the bowl and the bowl itself are stamped with Memento dew drop colors. The white dots on the fish were hand drawn with a Uniball Signo white pen. The greeting is stamped on vellum (I seem to like that design element lately) and then the ends were adhered to the back of the front panel. The panel itself is from the January SSS card kit ( Bazzill Glitz bling heavy weight card stock). The table under the bowl is My Favorite Things kraft card stock and the card base is The Card Shoppe (Bazzill) jelly bean. The heart embellishment is from My Minds Eye. Why do I like this card? Because it's just cute. I'm not going to post every card I make - I seem to make at least 4 or 5 a week, and I could never keep up. But, if I make one that I particularly like, I may post it here. I found the inspiration for this card at this link through Pinterest. Side note: Pinterest has been great for sparking my creativity as I make cards. Great resource. Thanks so all who pin! The background is done with distress inks added with a mini blender tool to Neenah solar white 80 pound card stock. Once I was done blending, I flicked water "enhanced" with perfect pearls on the cardstock. The snowman stamp set and dies are from Simon Says Stamp. 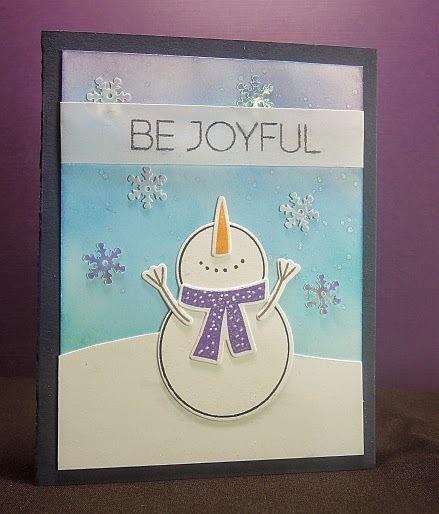 The Be Joyful sentiment is from the Be Joyful stamp set that was included in the November card kit from Simon Says Stamp (love that sentiment). It is stamped on vellum and the ends are adhered to the back of the snowman panel. The colored inks are Memento dew drop ink pads and the black ink is Versafine Onyx Black. The snowflakes are from Simon Says Stamp (also included in a monthly kit, but I loved them so much, I ordered more). The panel is mounted on an A2 card made from Bazzill The Card Shoppe Blueberry Sour paper. I love his smile, and that he looks so happy. The particular card was made at the request of my 18 year old to give to a friend, but I also made several of them and stamped Happy New Year inside to send out at the beginning of the year. I'm still working on setting up a photography area for the cards. I still don't have the lighting quite right. My husband has a saying: A clean car is a happy car and a happy car runs better. 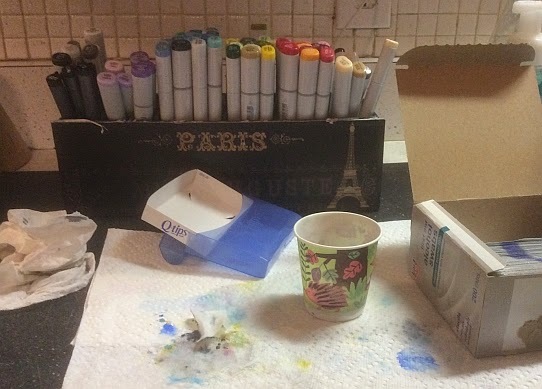 Applying the same philosophy to copic makers, I spent part of the day today cleaning my markers. As you read this, please allow this disclaimer to sink into your mind. I am not a copic marker expert. I am a beginner. My advice is not worth the paper towels I used to blot the rubbing alcohol I used when I cleaned the markers. I used two sources to design my procedure today. The first was Sandy Alnock's session in the Copics for Card Makers class (onlineclasses.com). The second was from a YouTube video on the Copic in the Classroom channel. Why clean them? They were icky, that's why. All the ink that gathers in the lid and around the nib can prevent the lids from sealing well. And, well, they look so much prettier when they are clean. How did I clean them? Sandy recommended using colorless blender solution. I don't have any of that, so I followed Colleen Shann's procedure pretty closely. I soaked the lids in 91% rubbing alcohol for a few moments in a disposable Dixie cup while I cleaned the gray plastic area around the nib with an alcohol swab. Once that area was clean, I dried it with a paper towel. This is where my method differed from Colleen's. She recommended a cotton ball. I used the swab, and was very careful to keep it away from the nib. My understanding is that you don't want rubbing alcohol or fibers to touch the nib. I would be a Bad Thing. Once the lid had soaked long enough, I used a Q-tip to clean it, and then the other end of the Q-tip to dry the inside of the lid. I used a papertowel to dry the outside of the lid. If there was any ink on the body of the marker, I wiped it away with the swab. I made sure the cap was dry before I recapped the marker (important), and then it was finished. Clean markers are happy markers, and I hope happy markers color better.